Successfully Added Stainless Steel Digital Kitchen Scale to your Shopping Cart. 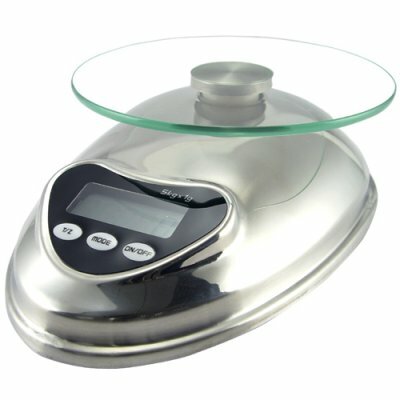 Stainless Steel Digital Kitchen Scale. An accurate, durable and well crafted digital scale for your kitchen. It's dinner time! And we are serving up a hearty helping of high-tech practicality with a dash of style on the side. This Stainless Steel Digital Kitchen Scale has a sleek design, easy-to- read display, compact size, and ability to display standard or metric units, making it a great addition to any modern kitchen in any part of the world. The Stainless Steel Digital Kitchen Scale is sensitive enough to weigh just a few grams of sugar and strong enough to support up to 5.2kg (11.4 pounds) of family sized helpings of food. The scale can display weight in grams, kilograms, ounces or pounds. With no wires or cords, the Stainless Steel Digital Kitchen Scale won't tie up any outlets in your kitchen. The glass plate unscrews quickly to make cleaning the plate and the stainless steel base easy. Less time cleaning means more time cooking! And eating! This Stainless Steel Digital Kitchen Scale is available at a family-friendly price from your leader in factory-direct electronic products, Chinavasion. Is the scale waterproof? No, please do not submerge the scale in water. The scale should be cleaned with a moist towel. What is the maximum weight this scale can support? It can support a max of 5.2 KG (11.46 LB).